- Premium material.Made of high quality stainless steel, comfortable to wear for day and night. - Easy to install. Quick release mechanism makes it easy to change out bands in seconds. - Smooth edges.Breathable milanese loop with smooth edges, won't damage your sweater. - Strong magnet. You can freely adjust the length to a proper fit in seconds. The strong magnet will always hold your watch in place, it won't moving around. 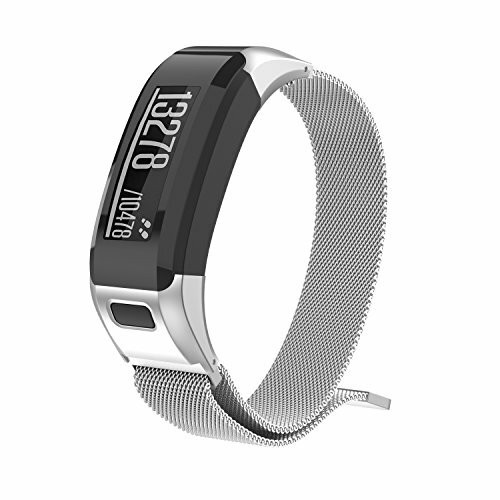 Package Content - 1* milanese band for Vivosmart HR. - Device not included. It doesn't fit for vivosmart HR+. [Premium Milanese Loop] The watch band is made of premium stainless steel, high-tech vacuum plated surface. Nano-permeable plating process will makes the color lasting long. Perfectly fit for your Garmin Vivosmart HR tracker. Pls note that it doesn't fit vivosmart HR+. [Strong Magnetic Clasp] Advanced and convenient design, magnetic closure allows you to lock or unlock your watch in seconds. The magnet is strong enough to hold your watch secure. It's sturdy even under rough movement or activities. This milanese band fits for most occasions, indoor/outdoor/travel/meeting/exercise/party. [Smooth Edges] The milanese loop made of excellent 304 stainless steel, smooth surface provides a comfortable feel to your wrist. The 0.3mm square hole makes it easy for the skin to breathe, the smooth edges won't damage sweaters. Small size fits wrist 6.70-9.06 inches (170-230mm), Large size fits wrist 7.49-10.25 inches (190-260mm). [Quick Release Pins] Quick release design makes it simple to install or remove band by your fingers, you don't need any assistant tools. If you need to switch bands very often to fit your mood or cloth, this is a nice alternative. [Lifetime Customer Support] 12-month warranty and lifetime tech support. We are happy to resend a replacement band or accessory if there's any quality issues of the band. Please kindly contact us once there's any technical problems or quality issues. We're always here for you.